Really, those two words are reason enough for me to want to eat any muffin, no matter what’s on the inside. But these zucchini muffins are so much more. But these Zucchini Muffins with Maple Walnut Streusel (adapted from my honey-sweetened Whole Wheat Zucchini Bread recipe) are the real deal. They tick all the “It-tastes-like-cake-but-is-actually-healthy” boxes that a good muffin should. ✔ A dairy free option for those with dairy allergies or restrictions. Streusel topping aside, another reason I love these muffins is that they feature seasonal produce. If you’re shopping at farmer’s markets or coops, or growing your own vegetables, you probably already know that summer is peak season for zucchini. The first summer I participated in a local coop, I was overwhelmed by the number and size of zucchini in my coop box week after week after week after week…after week. But, you know what? It challenged me to try new recipes, and I learned so much about gratefully eating foods in their season rather than picking and choosing whatever I wanted from the grocery store each week. These streusel-topped zucchini muffins are a healthy summer breakfast treat. Refined sugar free, high in fiber & have omega-3's, plus a dairy free option! Preheat oven to 325 degrees. Prepare standard size muffin tins with butter or paper liners, then set aside. Use the grater disk of a food processor to grate zucchini, then set aside. In a small bowl, stir together flour, chia/flax, salt, baking soda, baking powder, and cinnamon. In a large mixing bowl, whisk the egg, butter/oil, applesauce, honey and vanilla. Add dry ingredients and stir gently, until just mixed. Fold in the zucchini. Pour the batter into muffin tins, filling 3/4 full. Set aside. In a small bowl, combine flour, cinnamon, and salt. Add the maple and 2 Tbsp of walnuts. Cut in the butter or coconut oil (note - the maple syrup will result in a softer crumb than traditional streusel toppings using granulated sugars). Use clean hands to sprinkle the crumb topping evenly over each muffin top. 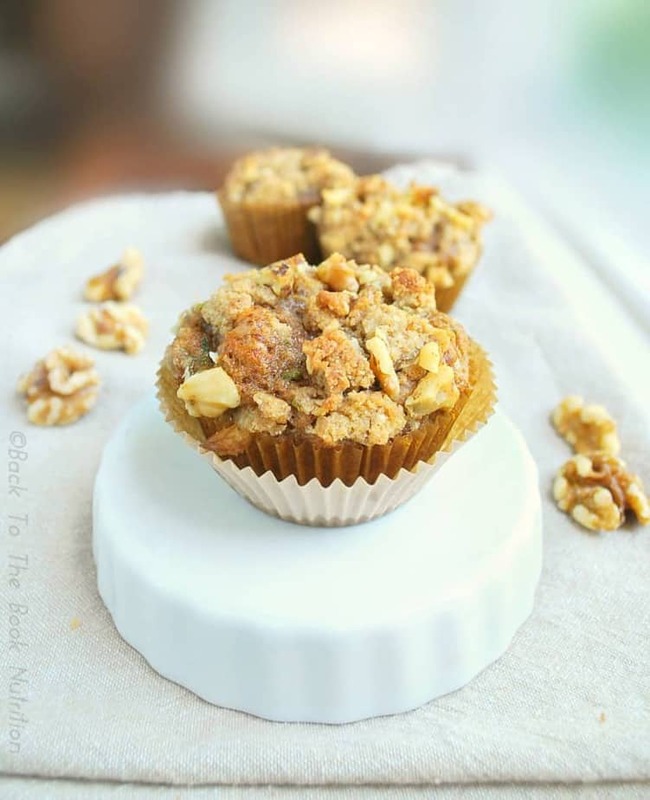 Sprinkle the remaining 2 Tbsp walnuts evenly over each crumb-topped muffin. Bake for approximately 25 minutes, or until a toothpick inserted into the center comes out clean. Broil the muffins for an additional 1-2 minutes, until the crumb topping just begins to brown (this is optional, but I love the little bit of crisp it gives to the topping!). I overfill my muffin tins a bit to create a nice, large top (who doesn't love a good muffin top? ); but if you fill your tins just to the typical 2/3 full level, this recipe will make 12 muffins instead of just 9. In that case, you may want to increase the streusel topping ingredients to sufficiently cover all 12 muffins. Leave a comment below to let me know what you think of this recipe, or share another favorite zucchini recipe of your own! Note: This post contains affiliate links. By making purchases through these links, you’ll be sending a little money my way for developing more great zucchini recipes. Thanks! Mmmm! These look delicious. I’m not a huge fan of zucchini, but I’m going to try these!! Thanks for sharing the recipe, Cindy – lentils and zucchini sound like a great combination! I love using zucchini in baked goods and these look fab… Plus, streusel totally makes everything better!! Thanks, Sues – I definitely agree about the streusel! Wow. Loving the sound of the walnut streusell. What a great way to use up some zucchini. These sound perfect for breakfast or a healthy snack! Yumm! This looks like an awesome way to use up zucchini! Yes, perfect solution for peak zucchini season! I love zucchini muffins and adore the maple walnut streusel you have on the top! I love how healthy and delicious these look and I can’t wait to try them! These sound decadent. The fact they are healthy is an added bonus. Saved to Pocket to make later. Great – hope you love them as much we do, Nancie! I think I fell in love with this topping just now what a great addition to this muffin. I must try this! I love zucchini anything! Thanks for sharing this wonderful recipe! These muffins are both healthy and delicious. What more could you ask for? These look fantastic, that strudel!! I love baking with zucchini, I will definitely put these muffins on my list of things to try. I have never tried to ZUCCHINI MUFFINS but it looks so delicious and so simple to make. I think it is a good snacks to prepare for my kids on this coming weekends. Your kids will love them, Emma! I”m all in with zucchini muffins, especially with late summer/early fall squash that is super abundant!! I adore the topping you’ve paired with these fantastic muffins! Thank you, Amy – enjoy! This is a perfect recipe! Maple Walnut Streusel sounds amazing! Pinning this to try when it gets a smidge cooler (heat wave + my oven = yikes!!!) I LOVE zucchini breads, so I bet these muffins are amazing. That’s perfect, Catilin! Even though zucchini is a summer vegetable, the cinnamon flavor is perfect for fall too! You should definitely try them – you can’t really tell it’s zucchini! My husband would flip over these! He love maple and walnuts more than anything! I hope he loves them, Sara! These look fantastic! I keep forgetting zucchini can make sweet stuff!! I’m definitely trying this!!! Yes, you almost wouldn’t know the zucchini is in there! Zucchini is one of my favorite foods, it’s delicious baked like a loaf of bread. This recipe of zucchini muffins looks so appetizing. Thanks for your comment, Elle! Oh man these look so so tasty. The streusel on top looks perfect. Drool! Ok, these sound crazy good. Especially with the streusel on top – that tends to be my favorite part of the muffin for sure. I am definitely trying this recipe. YUM!!! I’m with you – the streusel is my favorite part too! Ooh what a great idea for a recipe. I love the sound of zucchini in a muffin and they look delicious! You’re welcome – I hope your family enjoys them, Nathan!